New Delhi — 110 002. 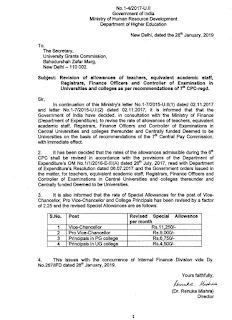 Subject: Revision of allowances of teachers, equivalent academic staff, Registrars, Finance Officers and Controller of Examination in Universities and colleges as per recommendations of 7th CPC-regd. In continuation of this Ministry's letter No.1-7/2015-U.II(1) dated 02.11.2017 and letter No.1-7/2015-U.II(2) dated 02.11.2017, it is informed that that the Government of India have decided, in consultation with the Ministry of Finance (Department of Expenditure), to revise the rate of allowances of teachers, equivalent academic staff, Registrars, Finance Officers and Controller of Examinations in Central Universities and colleges there under and Centrally funded Deemed to be Universities on the basis of recommendations of the 7th Central Pay Commission, with immediate effect. 2. 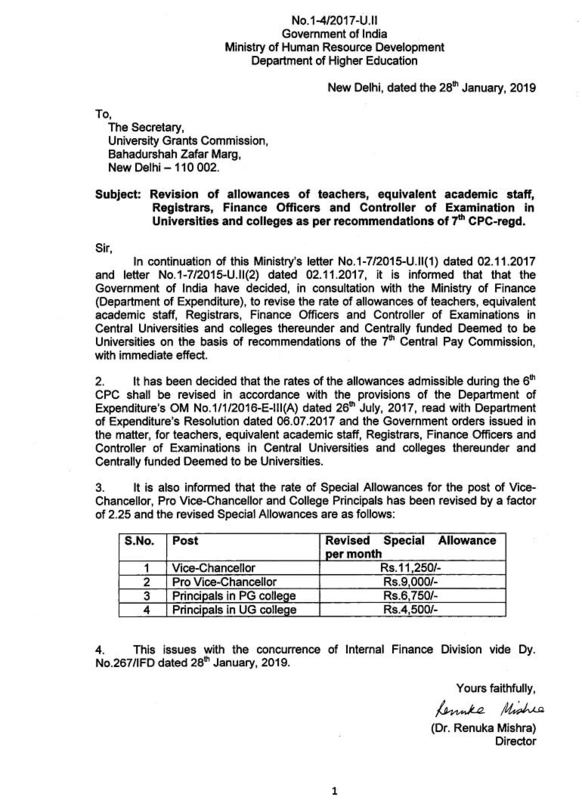 It has been decided that the rates of the allowances admissible during the 6th CPC shall be revised in accordance with the provisions of the Department of Expenditure’s OM No.1/1/2016-E-lII(A) dated 26th July, 2017, read with Department of Expenditure’s Resolution dated 06.07.2017 and the Government orders issued in the matter, for teachers, equivalent academic staff, Registrars, Finance Officers and Controller of Examinations in Central Universities and colleges thereunder and Centrally funded Deemed to be Universities. 4. This issues with the concurrence of Internal Finance Division vide Dy. No.267/IFD dated 28th January, 2019.